When a business plans to launch any product/service into the market, it always has a target audience in mind who would be using this product. Now even though the target audience are the ones that will be the source of revenue for the firm while acquiring market share, audiences in general are apprehensive of shifting from their existing products and adopting new products. Typically for FMCG products, businesses conduct free trials to increase customer adoption but when it comes to technology products, customer adoption is a big challenge. Innovators – Innovators are typically the first individuals to adopt any new innovative product or service launched into the market. Innovators have good financial status, are geeky, and are open to experimentation. They also like to show off any new product they have to their social circles ansd their risk tolerance allows them to adopt technologies that may ultimately fail. Early Adopters– Typically when the innovators try out a new product/service, they talk about it and their feedback typically impacts the second fastest category of individuals who would adopt the innovation which is Early Adopter. While Innovators are important to test the product initially, it is the Early Adopters that have the highest degree of opinion leadership among the other adopter categories and their feedback typically creates or kills the product/service. 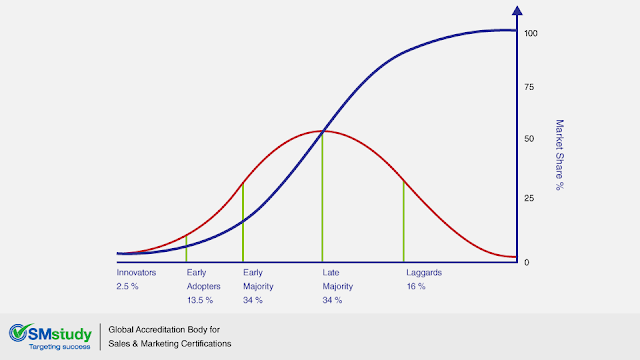 Early adopters are more discreet in adoption choices than innovators. They use judicious choice of adoption to help them maintain a central communication position. Early Majority– Individuals in this category adopt the innovation after a varying degree of time. Their time of adoption is significantly longer than the innovators and early adopters and they normally have a lower risk appetite and would only purchase products that carry some credibility or atleast products launched by credible organizations. They are heavily influenced by the opinions of Innovators and Early Adopters. Late Majority– They adopt an innovation after the average individual. The people falling under this category are reluctant to innovations and adopt it only after the majority of society has adopted the innovation. Late Majority are often financially prudent, have little opinion leadership and are not influenced by new technology immediately. The general attraction for Later Majority would be products sold at a lower price than existing products or products that create a network effect wherein Late Majority are influenced by people in their circles using the new product/technology. Laggards– They are the last to adopt an innovation. Laggards are almost repulsive to change, typically avoid technology and are inherently not outgoing and in contact with only family and close friends. Understanding these various segments is extremely important for any business to grow and establish themselves in the market. For example, when Tesla launched their cars, the initial cars were extremely expensive and were bought by high net worth individuals who liked the exclusivity the car gave them and also how it projected them as being environmentally conscious. This move helped Tesla because by producing the initial few cars, they were able to get good media coverage while also ensuring that since they were targeting people with dispensable income, they could recover their initial investment by pricing the product high. But now that their is increased acceptance for the product, they are able to come up with lower priced products because they have the market for it and can afford to mass produce them. Had Tesla just gone ahead and mass produced this low price version, it could very well have been stuck with unsold inventory resulting in failure.